Wireless door locks are systems used to lock and unlock doors without the need of electrical wiring. They are usually powered with internal battery support systems. All non-door applications have not been considered in the scope of research. The global wireless door lock market is estimated to be valued at US$ 857.2 Mn by 2018 end and is expected to reach US$ 1,799.3 Mn by the end of 2026, expanding at a CAGR of 9.7% over the forecast period. The global wireless door lock market is anticipated to represent an incremental opportunity of US$ 942.0 Mn between 2018 and 2026. The demand for smart homes has increased significantly in developed regions over the past five years, owing to the increasing use of smartphones and other smart devices. Residential security is a major concern for people living in multifamily apartments. Smart home applications include advanced security aspects such as security alarms, sensors, electronic locks and cameras along with other smart features. People are adopting systems with advanced security features embedded in their smart homes and considering it as a value added service for better quality of living. 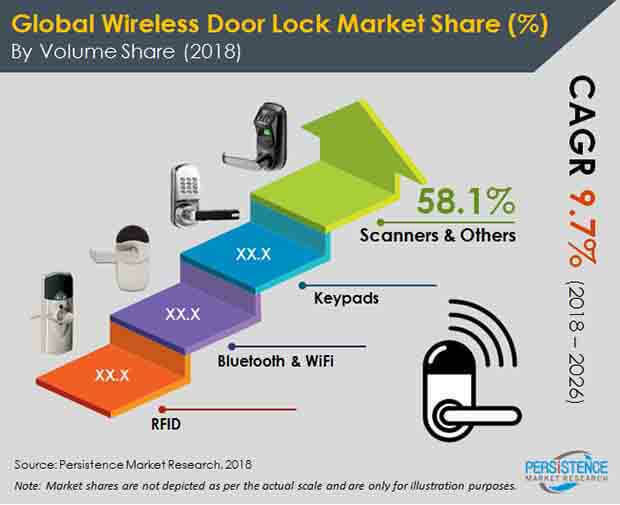 These factors are encouraging electronic lock vendors to innovate their locking solutions, which in turn is accelerating the growth of the wireless door lock market. Residential & non-residential construction industries represent potential growth opportunities for the manufacturers of wireless door locks. Construction and industrialization is increasing across the globe, which in turn is accelerating the growth of the security solutions market and impacting the sales of wireless door locks. The wireless door lock market is dominated by a few well-known brands that are more reliable in offering better security assurance. However, these systems have high installation and maintenance costs, which hampers the adoption of wireless door locks on a mass scale by consumers in under-developed or developing economies. The global wireless door lock market has been segmented on the basis of connectivity, end use and region. On the basis of connectivity, the global wireless door lock market is segmented into Bluetooth & Wi-Fi, RFID, Keypads, Scanners and Others. On the basis of end use, it is segmented into residential, commercial, government and industrial. Significant regions covered in the report include North America, Latin America, Europe, SEA & Pacific, China, Japan and Middle East & Africa. RFID, Bluetooth & RFID segments are projected to account for a 26.4% volume share in the global wireless door lock market by 2026 end, increasing with a double-digit growth rate over the forecast period. The wireless door lock market is also segmented on the basis of components including scanners, battery, transceiver, locks and others. The wireless door lock components market is analyzed and has also been validated from wireless door lock (system) perspective. From a region perspective, North America & Europe are estimated to hold more than 60% of the market volume share in 2018. The global wireless door lock market is expected to increase at a volume CAGR of 9.4% in terms of volume over the forecast period. Growth of the wireless door lock market in Latin America is expected to grow from 9% to 11% between 2016 and 2026, in term of volume. The India wireless door lock market is expected to witness high growth with a CAGR of 14.5% as compared to the global average between 2018 and 2026. Some of the key market participants reported in this study of the global wireless door lock market include ASSA Abloy, Dormakaba Holding AG, Allegion PLC, Salto Systems S.L., Centurion Systems. Sentrilock LLC, Hanman International Pte Ltd, Honeywell International, Inc., Robert Bosch GmbH, Godrej Locking Solutions & Systems, Stanley Black & Decker Inc, Spectrum Brands Holdings, Inc. and Johnson Control International Inc., among others.